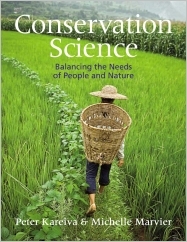 Conservation Science is the first textbook to teach the scientific foundations of conservation biology while highlighting strategies to better connect its practice with the needs and priorities of a growing human population. Part I. Why Conservation is Needed 1. Humans Are the Dominant Ecological Force 2. Biodiversity and Extinction 3. Ecosystem Services: How Nature Pays for Itself Part II. Policy, Protected Areas, and Planning 4. Policy Responses to Biodiversity Loss and Ecosystem Degradation 5. Conservation in Protected Areas and on Private Land 6. Conservation Planning and Priorities Part III. How Science Informs Conservation Strategies 7. The Perils of Small Populations 8. Population Size, Trend, and Viability 9. Assessing Threats and Choosing Conservation Actions 10. Islands of Nature and the Role of Dispersal 11. Restoration and Reintroduction: Fixing Problems After the Fact 12. Adaptive Management and Evidence-Based Conservation Part IV. Conservation Challenges in a World Shaped by Humans 13. Reversing Global Deforestation and Forest Degradation 14. Balancing Agriculture and Conservation 15. Building Sustainable Marine Fisheries 16. Managing Fresh Water for People and Nature 17. Getting Practical about Introduced Species 18. Climate Change on a Global Scale 19. Making Conservation a Success Story. Peter Kareiva and Michelle Marvier bring over thirty years of combined experience at non-governmental organizations, governmental agencies, and academia to illustrate just how conservation gets done “on the ground” in the world today. They have taught conservation both separately and together, and jointly conduct research in the field of conservation. Kareiva is the Chief Scientist and a Vice President for The Nature Conservancy, the world’s largest environmental organization. He also maintains an appointment at Santa Clara University in California. Before moving to The Nature Conservancy, Dr. Kareiva was the Director of the Division of Conservation Biology at National Oceanic and Atmospheric Administration (NOAA) Northwest Fisheries Science Center. He has served on the editorial boards of over a dozen different journals, has edited six books, and has been a faculty member at Brown University and the Universities of Washington and Virginia. He has received a Guggenheim fellowship and done research, consulting, teaching, or conservation work in twenty countries throughout Europe, Asia, and Latin America. He has authored more than 100 papers and articles, many of which were written in collaboration with colleagues in fisheries, agriculture, economics, and forestry. In 2007 he was elected a fellow of the American Academy of Arts and Science. Marvier is a professor of Biology and Environmental Studies at Santa Clara University, where she has taught undergraduate courses in conservation science since 2000. She has published over 40 articles, is on the editorial board for Frontiers in Ecology and the Environment, and regularly publishes articles with her undergraduate students. Dr. Marvier has also worked for NOAA Fisheries on salmon conservation and has served as an advisor to the U.S. Environmental Protection Agency, U.S. Department of Agriculture, and The Nature Conservancy on matters of statistics, monitoring, and risk analysis.